Quite recently, Firmenich took our class on a very special olfactory experience and gave us a glimpse into the curious world of fragrances and flavors. Most people probably have never heard of Firmenich before, yet the products produced by companies that work hand-in-hand with Firmenich unknowingly surround us. From fragrances in perfumes, body care and house care, to flavors found in beverages and food, Firmenich is responsible for the everyday pleasures we find in life. Our tour started with a presentation of the company by Dephine Krug, who is in charge of recruitment and relations with schools. She highlighted the main missions of Firmenich, which are creativity, intensive research, and responsible sourcing. Afterwards, we had a few special guest speakers that explained to us their main roles within the company and their day-to-day activities. We met Severine Cardot who is the Fragrance Development Manager, Amandine Vepierre who is the Associate Marketing Director in Fine Fragrances, and we also met Dominique Roques, who has the very special role of Head of Natural Purchasing. Monsieur Roques explained to us the difference between natural oils and synthetic molecules, and the challenges and opportunities that he faces in his role. We then embarked on an olfactory journey with the smell of vetiver and a beautiful video, which showed how this ingredient is sourced in Haiti, and the structure Firmenich has put in place to protect the local farmers and producers. 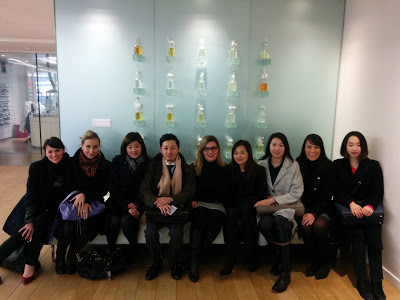 The second half of our visit we had the pleasure to meet a master perfumer and also experience the new scents inspired by the Pantone colors of the year, which are rose quarts and blue serenity. We watched a concept video while going through the perfumes one by one. There were key notes that even untrained noses like us could pick up on: jasmine, pineapple, coconut, and candy. Looks like a sweet and carefree year ahead! 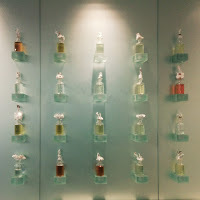 We also had the unique opportunity to do a tour of the laboratories after and see the creation production of scents taking place, and learn about the latest technologies in the fragrances and scents industry. Thank you Firmenich for opening our eyes to this invisible yet essential part of our everyday life!